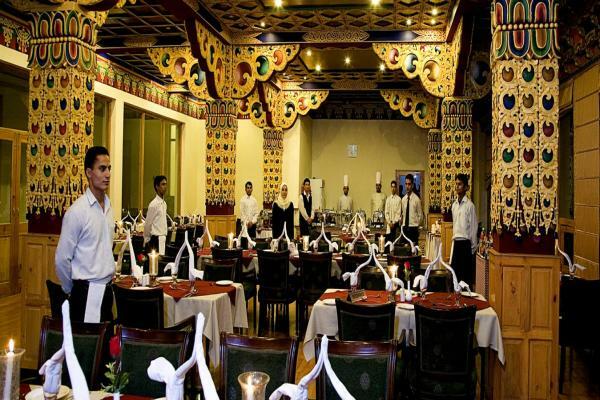 The Grand Dragon Hotel is the first 4 star hotel in Ladakh valley. It is an ideal place for the tourist to stay as it offers numerous recreational facilities like body massage, spa and some other facilities including laundry service/dry cleaning, meeting facilities, non smoking rooms, bathrobes, desk, internet access (wireless) etc. There is a uniqueness in their beauty and style, entirely different from other rooms of the hotel. These special rooms are well furnished with master bed, a sitting room and two attached bathrooms. Like deluxe rooms, they also offers you picturesque view of the beautiful Leh Palace and Khardongla Pass, the world’s highest motorable road. Other facilities at the royal suites include Telephone, LCD TV with satellite channels, internet and much more. 53 Well furnished and Decorated Rooms & Royal Suite with all modern amenities. Only Centrally Heated Hotel in Ladakh with an Elevator ( Lift ) and Open Round the Year. Shopping arcade, relaxing garden, exercise lawn and jogging track. These rooms are beautifully designed and provides all the luxurious facilities that a person wants.. The bathroom is well equipped with modern fittings and Quebec Shower. Other facilities at the room includes Telephone, LCD TV with satellite channels and much more. In the south direction, the large window of the room offers a most attractive and adorable view of the snow-covered Stok ranges. While on the north side, you can see beautiful Leh Palace ,Khardongla Pass, and the world’s highest motorable road.